Air Conditioning Companies Denver: Can You Repair an Air Conditioning System? Can You Repair an Air Conditioning System? This summer has been really hot. The tepid, nearly timid, spring must have been an elaborate tactic that mother nature employed to fool all of us. As we meandered into this summer, we all often heard people bemoaning the cooler temperatures and snows, but now we’re all surely missing it as we sweat buckets when we spend longer than 10 minutes outside of the house now. Nothing can spoil a summer in Boulder quite as efficiently as a broken or faltering air conditioner. That temperature control is so valuable and when it fails and leaves you at the mercy of the myriad of fans you can collect from your parent’s house and neighbors you’ll surely start feeling a little desperate. What do you do next? Should you accept that there’ll be no AC unit accessibility for the remainder of this sweaty armpit summer? Or better yet, is there a solution to this problem? The answer is yes, you can probably repair your AC. Though we’d go so far as to caution you not to go further than diagnosing the issue. Many AC units still use illegal, harmful chemicals that can easily damage your health. Thus, there’s a reason you should call an HVAC technician to do the actual repairing, but if you take it upon yourself to try and observe and diagnose the problem yourself, you can hardly damage the situation. To start your home diagnosis, you’ll first have to first identify a couple of the parts that are held within your air conditioner. The first thing that generally goes south on an AC unit is the capacitor. They’re recognizable as small cylinders that store the energy for the AC unit. They function by sending jolts to the motor to start it and keep it running. Chiefly, they’ll work with the compressor, or the blower motor as well as the outside fan in your unit. To check it out, you’ll only need a voltmeter and you’ll be able to use it to determine if your capacitor is blown out, but you could probably just watch the unit and listen for a few key determining factors. If you can hear humming but the fan isn’t running, it’s probably safe to assume that it’s your capacitor. You can definitively prove it’s the capacitor by taking a thin stick, sliding it through the fan guard and giving one of the blades a kick. If the fan gets going on its own, you can determine that you merely had a bad start capacitor rather than the whole part being broken. When it proves to not be the capacitor, you should probably check the conditioner itself. You’ll see this issue occur when the AC unit won’t turn at all. If the condenser is running, first make sure that it’s plugged in and your thermostat is properly set. If you overthink this solution, you’ll find that you doubt it, but it’s worth a try; turn down your thermostat 5 to 10 degrees first. If that proves to not work, try flipping the circuit breaker and estimate whether a blown fuse is the real problem or not. If the above solutions don’t work, you’ll probably have to reach out to a professional because the motor or compressor is out of whack. When you put your faith in Valiant Air, you’re investing in your own comfort. We’re dedicated to saving the day when your temperature control needs are most dire. There’s no need for you to have to suffer the inclimate and unpredictable mood swings of the Boulder and Denver weather. If you can’t figure out what’s wrong with your air conditioner, that’s what we’re here for. 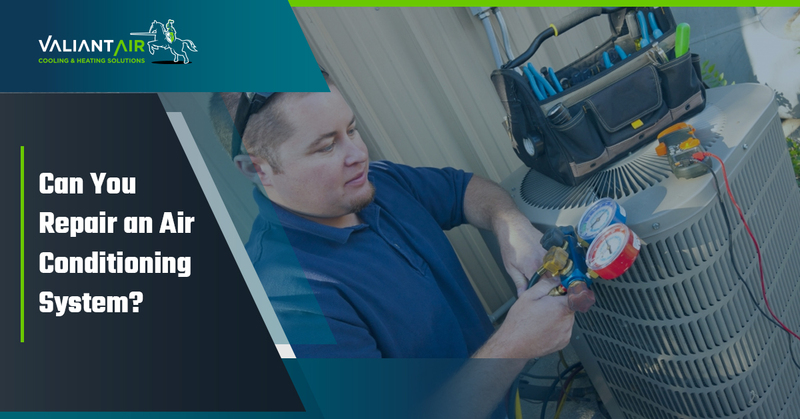 Reach out to us when you’re ready to get your air conditioner repaired in a quick and timely fashion that suits your budget.